As you have heard, Martha Stewart dumped me. I am now in the quest for exploring new magazines, and oooh la la, I've found a doozy! It's called Mary Jane's Farm and my aunt passes it along to me when she is finished with it. They've got a lot of interesting articles, one of them included the idea of "Glamping" - glamorous camping. These ladies go out with lace pillows, prom dresses, the whole 9 and get those totally adorable and awesome looking 50's tin trailer bubble RV's and glam them up. If it didn't get my prom dress dirty, I would be all over it. As long as it had extreme heat capabilities also. Cold = yuck. 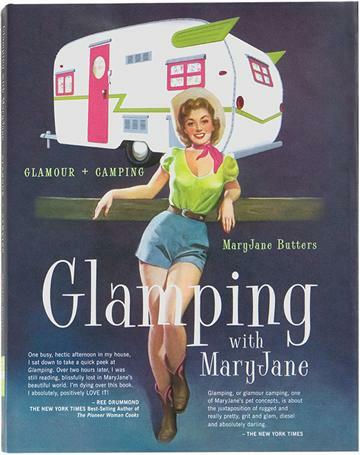 A new book by Mary Jane - Glamping! The cover says it all. They also feature organic gardening, doing-it-yourself stuff, health news, how to be non-toxic, etc. I read an article in there that I enjoyed so much, I wanted to share a piece of it with you. The author, Mary Jane, was bitten by a cat when she was in her twenties and actually got "cat scratch fever". The real deal. Ow. A doctor she visited suggested the right way to go was to have her lymph nodes removed. She knew better than to do that. But that's the whole deal with the modern thought in medicine. It's most invasive first, then down to least invasive. It's surgery first before lifestyle change. I think that's messed up. Hey. Do you have high cholesterol? Have you been taking meds and avoiding fat like the plague? Well... maybe you don't need to do that anymore. Actually, I would go so far to say as that might not even be the right thing to do at all. Dr. Lundell has operated on over 5,000 patients, all of whom had inflammation in their arteries. He says, "Without inflammation in the body, there is no way that cholesterol would accumulate in the walls of the blood vessels and cause heart disease." Did you hear what he just said? Read it again! Inflammation, not cholesterol, is the real problem. Cholesterol is produced by our bodies to help us. It helps fight stress and is a natural substance. When we get things out of whack by eating improperly (and I don't mean you ought to eat a low-fat diet; I mean you ought to be avoiding quasi-foodlike substances as if your life depended on it. Oh wait, it does. ), you irritate your insides! I've read articles about Big Sugar that show that the sugar industry has actually pointed its crack-laden finger at cholesterol in an effort to remove the reputation for clear and obvious danger from itself. The research is out there. Dig. F'real. You just might save your life if you get it right. And if you just need some straight up entertainment on that sugary subject, go check out this youtube video from 60 Minutes. The video itself is not entertaining per se, the entertainment comes when the interviewer is speaking with the Big Sugar dude who is probably a zillion-jillion-ga-billionaire. The dude dresses up and pretends to be a FARMER and makes sure to interview in a barn with a tractor behind him so he can look exceptionally wholesome. The very best part of all is when Mr. Sugarfakerbillionaire looks perplexingly, nay - seemingly dumbfounded! - at the suggestion that sugar could perhaps not be good for people and stares off into space as if he is pondering something he has never ever heard before. It is especially entertaining as he is not really a good liar/actor and he pulls a slimy politician thing and avoids the question completely with nonsensical answers. Raise your hand if you're shocked! Oh. Yeah. Anyway, if you want some more infotainment, go get yourself a subscription to that cool magazine!